Salesforce (NYSE:CRM), the global leader in CRM, recently announced Salesforce Tower Dublin, significantly expanding the company’s regional headquarters in Ireland. As part of the expansion, Salesforce plans to add 1,500 new local jobs over the next five years. Salesforce.org, the philanthropic arm of Salesforce, also announced a $1 million grant to Educate Together, supporting the opening and running of schools in Ireland. The announcements were made with An Taoiseach Leo Varadkar TD at an event in the Convention Centre Dublin (Jan 18th) where nearly 1,000 Salesforce employees were present to hear details of the new plans. Salesforce Tower Dublin will be an urban campus of four interconnected buildings located on North Wall Quay within Dublin’s vibrant Silicon Docks, overlooking the River Liffey. Salesforce employees are due to start moving into the 430,000 Sq ft campus in mid-2021. Salesforce has been named one of Ireland’s Best Places to Work for three years and the Best Workplace in Europe in 2018. Salesforce Tower Dublin will be a regional hub for employees across sales, customer service, technical and business operations delivering new innovations to its more than 150,000 customers around the world. Salesforce has over 1,400 employees in Dublin and more than 34,000 employees worldwide. With plans to add 1,500 new jobs over the next five years, the company is actively recruiting for roles across all functions including engineering, customer support, sales and business services. Ireland is home to many Salesforce customers including Brown Thomas, Arnotts, Icon PLC, Property Button and Ulster Bank. 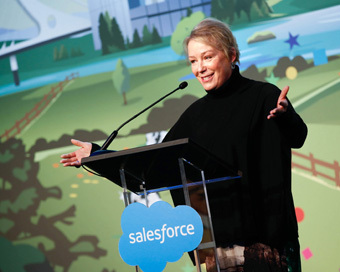 Pictured: Elizabeth Pinkham, Executive Vice President, Real Estate, Salesforce at the Convention Centre as Salesforce announced Salesforce Tower Dublin and the addition of 1,500 jobs over the next five years.